Now new details exposed by a city councilman during a public meeting show that it was actually the NPD officer who was at fault, and not the deceased victim. Just after 10 p.m. May 7, the officer had been dispatched to a call for a gunshot victim near the corner of Colley and Graydon avenues in Ghent, police said at the time. The crash happened north of Old Dominion University at the intersection of Surrey Crescent, more than 2 miles from the shooting. The officer, whose name police refused to release, was coming from farther north. Even though the police department already knows that their officer blatantly violated their policy regarding proper speed, and certainly knew this back in May, the issue is reportedly still “under investigation.” The department refuses to even say whether the involved officer has returned to work. It seems extremely unlikely that an ordinary citizen who caused a fatal accident while recklessly traveling at nearly three times the posted speed limit would experience this sort of protracted investigation and considerate delay of criminal charges. Fortunately, we don’t need to speculate on that matter. 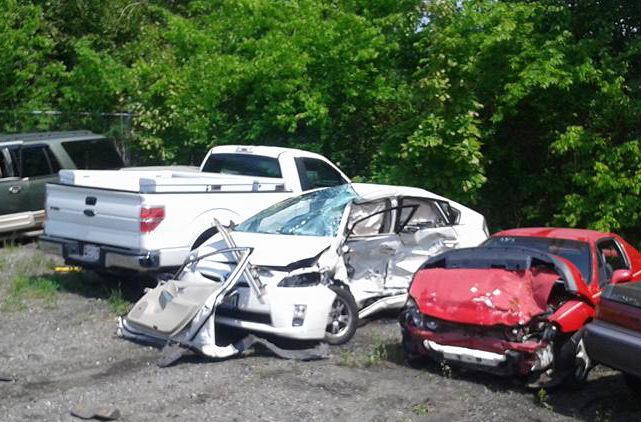 The auto enthusiast website, Jalopnik, has covered Virginia’s treatment of reckless drivers extensively. They hand it out like it’s Halloween candy, too. You drive 20 mph over the limit, it’s reckless driving. They even charge you with it for failing to properly signal, or when you’re found to be at fault in a car wreck. I’ve heard of some cases where people get 30 days in jail if they speed over 100 mph. During the 2014 Thanksgiving weekend, Virginia State Police cited 2,312 people for reckless driving and 9,789 people for speeding. That’s not even including all the tickets issued by local sheriff’s offices and police departments. The summer holiday weekends can have even higher numbers, with 2,673 reckless driving tickets issued by the State Police from July 4 to July 6, 2014.
not engaged in a criminal pursuit. Since this officer broke the law and violated department policy, reckless driving should be the least criminal charge he will face. That would still not be sufficient since his negligent actions took the life of an innocent bystander. The most appropriate case here would be aggravated involuntary manslaughter due to conduct “that was so gross, wanton and culpable as to show a reckless disregard for human life.” The punishment for this class 5 felony in Virginia is “a term of imprisonment of not less than one nor more than 20 years, one year of which shall be a mandatory minimum term of imprisonment,” and automatic revocation of one’s driver’s license. 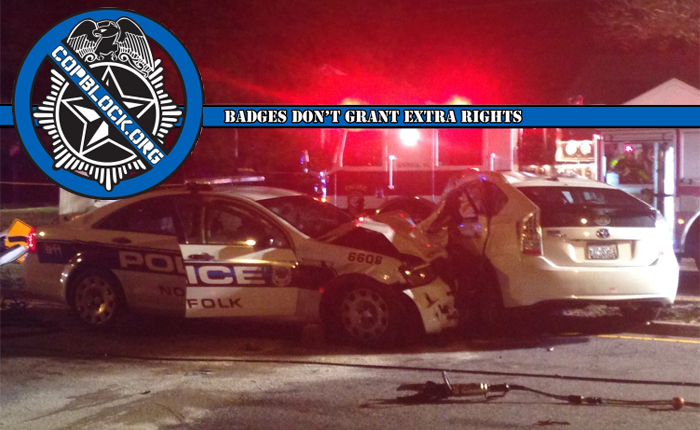 We shall see whether blue privilege shields this officer from facing the consequences of his deadly reckless driving. As the Virginian-Pilot reports: “A release said the officer had “emergency equipment” activated but did not specify whether that included both lights and siren.” Ashley’s Law doesn’t apper to be in effect here since there is no traffic light at the intersection where Crittsinger was killed. However,Virginia law does specify that emergency responders must show “due regard for safety of persons and property” while traveling above posted speed limits. “You need at least 75dBA of siren level to be audible through rolled up windows and over the car radio. In reality it might have to be 20dB higher if it’s a boom car, or a Mercedes, or some other vehicle with very good sound isolation. The maximum warning distance you can get with a siren that begins with a 100dBA at 10′ is about 160′.